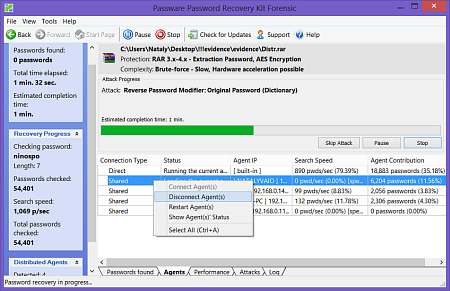 Passware Kit introduces a 64-bit version that works efficiently with thousands of files in batch mode and with larger dictionary files. Every Passware Kit license now comes with both 32-bit and 64-bit versions. 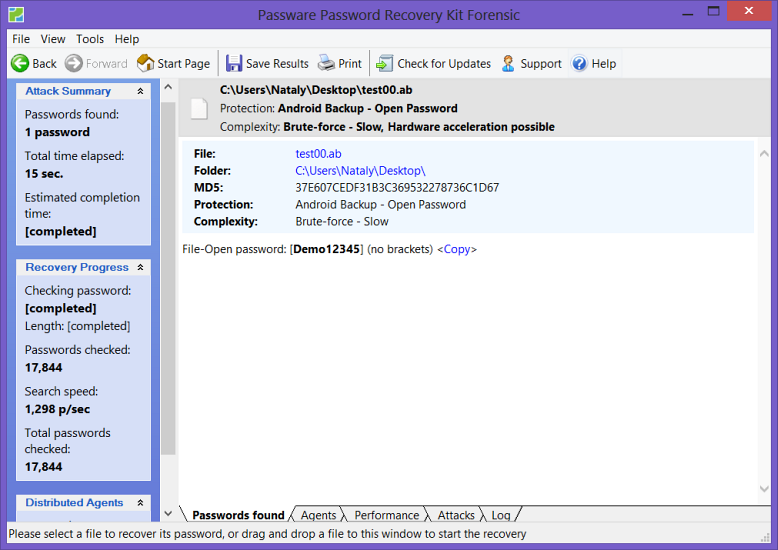 Passware Kit 13.0 leads the way in password recovery for Android smartphone backups. Average password recovery speed is about the same as that for iPhone backups - over 1,300 passwords per second. This can be accelerated up to 20 times faster if a computer has an NVIDIA or AMD graphic card, reaching up to 26,000 passwords per second with just a single GPU. Further acceleration is possible with distributed computing. This is currently the only accelerated solution for cracking Android passwords. NOTE: This feature is available in Enterprise and Forensic editions only. 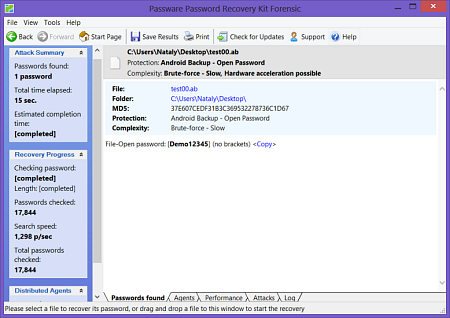 Passware Kit 13.0 now automatically saves all states of the password recovery processes, not just the last one. 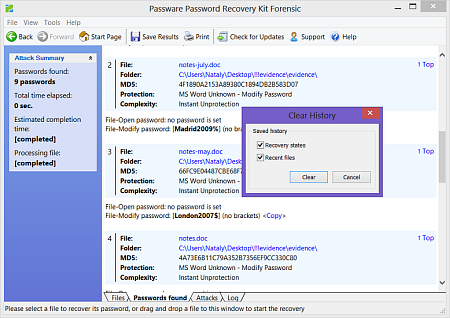 The histories of all previously found passwords, password recovery states, settings for each of the files, etc., are now saved even for batch password recovery processes and can be cleared by request. Passware Kit 13.0 now instantly resets passwords for Windows Small Business Server and Server 2013 user accounts. The product also supports 64-bit Windows Setup CDs for recording bootable password reset disks. 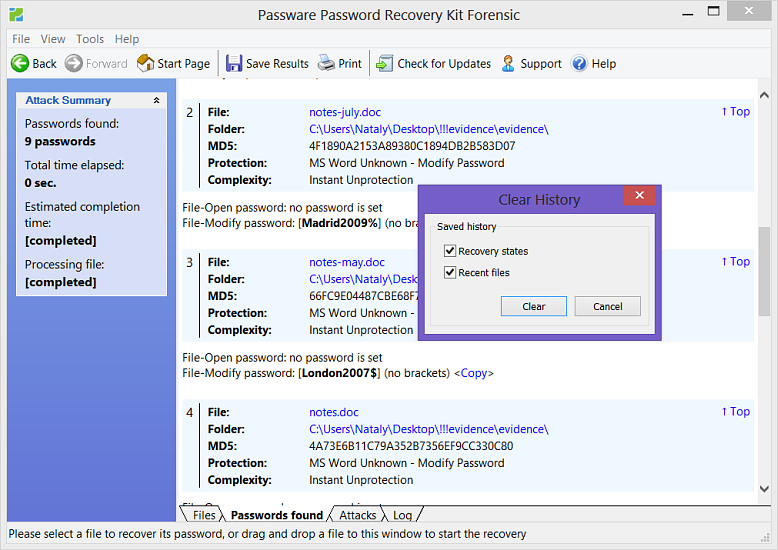 Passware Kit 13.0 recovers passwords for MS Office 2007-2013 documents and all types of archives at record speed! For example, with Passware Kit 13.0 64-bit version, the speed for MS Office 2013 passwords on a single AMD card is 2 times higher than with any known competitive product. Learn more about hardware acceleration. Passware Kit 13.0 now allows users to disconnect and restart Passware Kit Agents directly from Passware Kit Server, providing additional remote control options for the distributed password recovery process.